Are you looking for keto-friendly gum brands? Did you know that almost all popular brands of sugar-free gum contain artificial sweeteners and chemicals that are bad for your keto lifestyle? 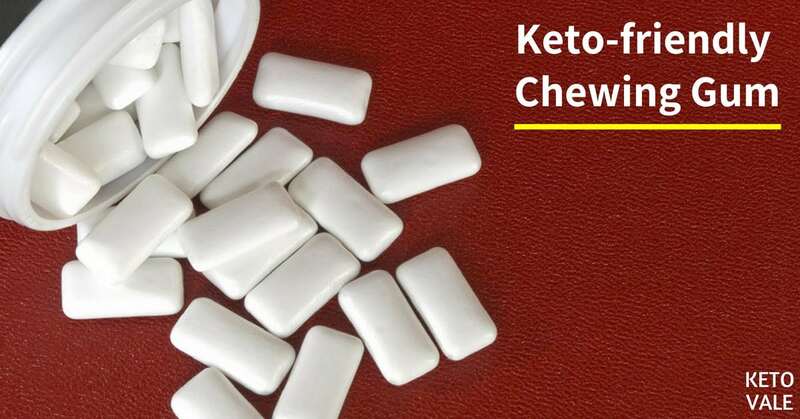 If you’re serious about ketosis, make sure to read this comprehensive review until the end to find out exactly what to look for and avoid when choosing chewing gums for your low carb lifestyle and the safest and most keto-compliant products. Here are some good news: chewing gum doesn’t just help you freshen your breath after meals or deal with the bad keto breath, it also has been shown to help you lose weight, overcome cravings for cigarettes, and manage hunger (1, 2, 3, 4). One study even found that chewing gum can help you concentrate for longer on tasks that require visual memory tasks while another study found that chewing gum increases your alertness (5, 6). But, and here's the big but: chewing the wrong kind of gum can increase your risk of getting a cavity due to its high sugar content. And even though you’re not chewing a lot at one time, a small amount can add up. It can even kick you out of ketosis. Sure, you can chew sugar-free gum, but most brands are loaded with artificial chemicals and aren’t keto friendly. We’ve put together a list of chewing gum brands that are free from aspartame and completely keto-friendly, so you can practice guilt free chewing and keep kicking those cravings. In a rush? Jump to the top chewing gum recommendations! ​What To Look For When Choosing Chewing Gum for Keto? If you’re one of those people who only chew sugar-free gum once in a blue moon (like on a date or when you have to be the guest speaker at a work meeting), then you probably have nothing to worry about. Most health experts will tell you that the regular kind of gum or the gum that contains sugar is what you really need to look out for because it causes cavities and it affects your blood sugar levels. But even if you’re only an occasional chewer, why not invest in a chewing gum that doesn’t contain harmful ingredients? For example, here’s a breakdown of the ingredients in a typical sugar-free gum: natural and artificial flavors, glycerol, mannitol, sorbitol, xylitol, gum base, acesulfame K, aspartame, BHT, sucralose and lecithin. Sounds pretty innocent, right? Afterall, there’s no high fructose corn syrup or apparent refined sugar. But if you look closely at these ingredients, some of them should be avoided for overall health purpose such as aspartame, BHT, and sucralose (7, 8, 9, 10, 11). Aspartame is probably the most undesirable ingredient, and probably the most dangerous one, and that’s why we made a list of gums that don’t contain this ingredient (12, 13, 14). According to the American Cancer Society, aspartame is broken down into phenylalanine, aspartic acid, and methanol, which is toxic in high amounts, especially in people with rare genetic disorders (15). A 2017 study that involved nearly 407,000 people found that aspartame was linked to an increased risk of heart disease and an enhanced body mass index (16). One study even found that aspartame is a “multi-potential carcinogenic compound whose carcinogenic effects are evident even at a daily dose of 20 mg/kg bw, much less than the current ADI for humans in Europe (40 mg/kg bw) and in the United States (50 mg/kg bw)” (17). This means that aspartame may increase your risk of cancer even if you eat lower amounts than what’s considered a normal intake. Other studies have linked aspartame to the following cancers: liver, lung, brain, prostate, breast and central system cancers (18, 19, 20). Other research shows that the possible dangers of aspartame don’t stop with cancer. For example, one study found that aspartame alters your gut microbiome and can lead to glucose intolerance even in healthy people who don’t have diabetes (21). Another study found that aspartame was linked to metabolic syndrome, weight gain, heart disease, and diabetes because of the metabolic disorders it appears to cause (22). There is even evidence to indicate that aspartame can affect your brain health. A 2014 animal study linked chronic aspartame intake to a distortion of neuronal function and an increase in brain cell death among some regions of the brain (23). The scary part is that these results occurred even though the rats were fed the FDA approved average daily intake. So even if you’re not overeating sugar-free gum, you could still affect your brain health with average intakes. Other animal studies have found that aspartame is linked to long-term memory loss (24, 25, 26). Speaking of brain health, did you know that chewing gum with aspartame in it might affect your mood and can even make you depressed (27, 28). Other scary side effects of aspartame include an increased risk of fibromyalgia, weight gain, premature menstruation, autism, kidney disease, and even aspartame disease, which is a term used to describe a group of conditions that are associated with aspartame intake (29, 30, 31, 32, 33, 34). If that’s not enough to make you stop chewing aspartame gum, then we don’t know what is! This is why this aspartame-free gum list is highly recommended! ​​​​Finding a sugar-free chewing gum that isn't packed full of chemicals is not impossible, you just have to know what to look for. We’ll let you in on a little secret. The best gums contain an ingredient called xylitol, which is naturally derived from sugar alcohols and helps keep your teeth healthy. Because xylitol is found in many fruits and vegetables, it is considered natural and a much better alternative to aspartame. You also naturally produce a small amount of xylitol in your body during the normal metabolism process. Xylitol is just as sweet as regular table sugar, but it has 40 percent fewer calories. It can be made from birch trees or processed in a lab using a type of plant fiber called xylan. Plus, its carbohydrate calories don’t count as “net carbs”, so you don’t have to worry about it raising your blood sugar levels or interfering with ketosis. Studies show that xylitol starves out the bacteria in your mouth that causes cavities and tooth decay, which makes it a perfect ingredient to add to your after-meal gum (35). Some research even shows that chewing gum that contains xylitol after eating can reduce tooth decay and cavities significantly (36, 37, 38). Additionally, xylitol has been shown to reduce the occurrence of ear infections in children. It also helps fight yeast infections caused by Candida albicans. One study found that xylitol starves out the harmful bacteria in your ears much like it does the bacteria in your mouth that causes cavities (39). Children with recurrent ear infections who chewed xylitol-sweetened gum daily reduced their rate of infection by 40 percent (40). Similarly, xylitol reduces harmful yeast such as Candida albicans from sticking to a surface and causing infection (41). Other potential health benefits of xylitol include an increased production of collagen, which can lead to reduced skin aging, and protection against osteoporosis, according to animal studies (42, 43). Aside from being highly toxic to dogs, xylitol appears to be safe for humans. Of course, you don’t want to eat a ton of it as you might experience digestive upset. Either way, it’s a million times better than chewing on a stick of cancer. In addition to finding a gum that’s sweetened with xylitol only, you’ll want to make sure your keto gum does not contain sugar or aspartame of any kind. This means that even if the first ingredient in the gum is xylitol, it’s a good idea to check to make sure no other sneaky ingredients are worked into your gum. Your keto gum should contain natural ingredients only, no sugar and no aspartame. ​To save you time, we’ve researched the best keto-friendly chewing gums out there and put together a list to help you replace your old sugar-free stache stat. 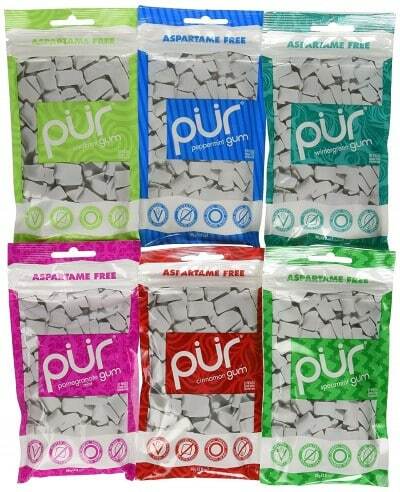 The first thing you’ll notice about PUR Gum is that it comes in fun, brightly colored packages, which is very appealing to the eyes. But it’s what is inside (and what isn’t) that makes this gum really shine. It’s made with all natural, keto-friendly ingredients, including xylitol, gum base, gum arabic, glycerol, natural flavors, carnauba wax, and tocopherols. That’s it! This gum comes in six different flavors that include spearmint, peppermint, pomegranate mint, cinnamon, wintermint, and cool mint. You’ll find some different ingredients among the different flavors, but all of them are completely natural and good for you. For example, the spearmint flavor contains white tea, and the pomegranate mint flavor contains pomegranate powder, which both have antioxidant properties. It’s even Amazon’s choice for aspartame-free gum. You'll want to buy this gum in bulk and switch up the flavors so you're never bored. Spry Gum is pretty popular among keto dieters, but here’s a breakdown of it if you’re not already familiar. Spry contains no artificial flavors or sweeteners, such as aspartame. It also comes in a really yummy bubble gum flavor. So if you’re looking for a gum that actually tastes like bubblegum, this is it. 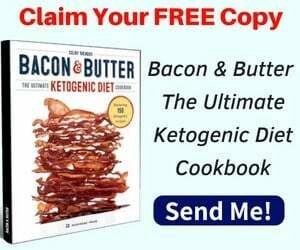 Here is a list of its keto-approved ingredients: xylitol, gum base, natural flavors, gum arabic, calcium carbonate, sunflower lecithin, stevia, carnauba wax, spearmint oil. 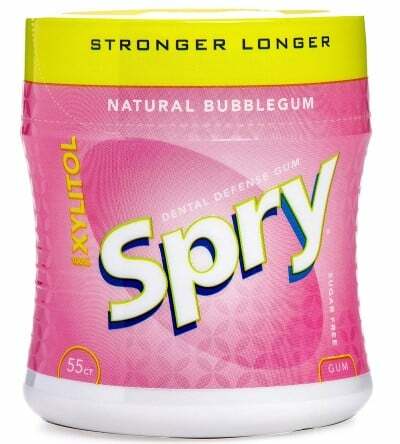 Spry gum also contains spearmint oil to aid in flavor and contribute to a long list of health benefits, including nerve and muscle spasm support, relief from digestive problems and headaches, brain stimulation, and relief from respiratory problems. Keep a bottle in your car and one at your desk to make sure you have fresh breath all day. 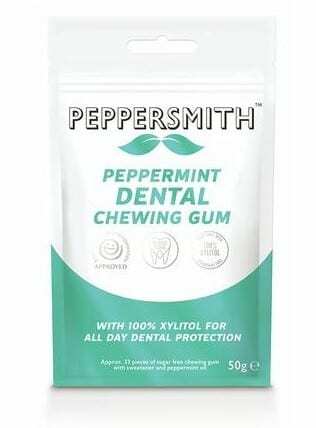 Rounding out our list of keto-friendly gums that don’t contain aspartame is Peppersmith Peppermint Chewing Gum. You can use it to keep your teeth clean and healthy even when your toothbrush is at home. Peppersmith gum contains no aspartame and is completely natural. Ingredients include xylitol, gum base, english peppermint oil, natural menthol, gum arabic, sunflower lecithin, vegetable glycerol, and carnauba wax. This brand of chewing gum has a coupe of advantages over the rest. First, it contains peppermint oil, which is great for freshening the breath and alleviating digestive upset. It also has antiviral and antimicrobial propertie, which is a pretty impressive ingredient to put in gum. Next, this gum contains the preferred source of lecithin in the form of sunflower (not soy) lecithin, so you’re getting a healthier version. Finally, this gum has natural menthol, which is a form of peppermint oil so you’re getting a double dose of all the health benefits that peppermint has to offer. Plus, the company offers a money back guarantee after 30 days if you’re not satisfied with the gum. Chew on, friends! 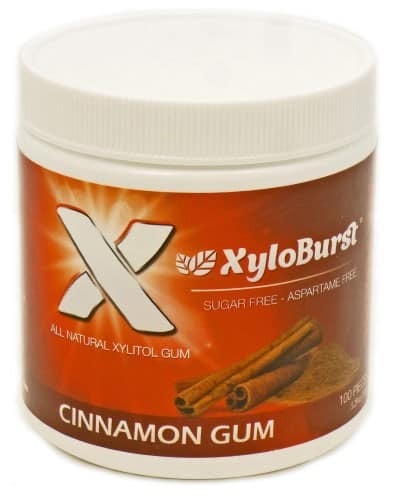 XyloBurst is another brand of aspartame-free gum that contains a good source of xylitol. According to the manufacturer's website, each piece of gum contains over one gram of xylitol, and they recommend eating six to eight grams a day. So that means you get to enjoy a piece or two after every meal without feeling guilty. It’s also gluten-free and made with non-GMO ingredients, including xylitol, gum base, natural flavors (cinnamon oil), vegetable glycerin, gum arabic, soy lecithin (non-GMO), calcium carbonate, and carnauba wax (glazing agent). One of the nice things about this gum is that it contains cinnamon oil, which has been shown to boost brain health, help purify the blood, improve blood flow, relieve pain naturally, aid in weight loss, help control diabetes, treat infections and prevent colon cancer (44). Not a bad way to fresh your breath! Although the lecithin in this gum is derived from soy, it’s made from non-GMO ingredients, which is at least a little better than non-GMO soy lecithin. Research shows that soy lecithin does contain some health benefits, such as boosting immunity and improving cognitive function (45, 46). Sunflower lecithin is the preferred ingredient in this case, but it probably wouldn’t make your gum taste too good, so we understand why it’s commonly used here. This brand comes in ten different flavors all together, which makes it a great gum to put in your keto-friendly rotation with your teeth and gums in mind. It also contains the preferred source of calcium. At 1.06 grams of xylitol per piece, Epic Dental gum contains 45 percent more xylitol than other brands, according to the brand’s website. 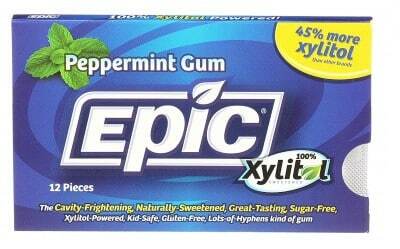 This makes Epic Dental gum the king of xylitol! Why is this important? As stated above, xylitol helps prevent tooth decay, so chewing a few sticks per day can help make your dentist happy. Other ingredients in this gum include gum base, natural flavors, soy lecithin, gum arabic, titanium dioxide, and carnauba wax. It’s completely natural and gluten-free. Plus, it doesn’t contain any aspartame. It’s available in eight different flavors, so you don’t get bored by chewing the same kind, including bubblegum, cinnamon, spearmint, wintermint, peppermint, and orange-mango, just to name a few. That means you can enjoy a new flavor every day of the week (plus one). Chewing sugar-free gum is a great way to freshen your breath and reduce your risk of cavities after meals. But most store-bought brands of sugar-free gum contain dangerous ingredients, including aspartame, which has been linked to cancer and a host of other unpleasant side effects. If you don’t chew sugar-free gum, then you’re at risk of exposing yourself to unwanted carbs and getting kicked out of ketosis. We’ve put together a list of the top keto-friendly gums that contain xylitol, which is a natural sweetener with a long list of health benefits. Research shows that chewing xylitol-containing gum after meals helps reduce cavities and gum disease. If xylitol content is important to you, choose a gum from our list that contains over one gram, which is a lot for gum. We encourage you to try the top 3 brands on this list to find the one that you like best for your keto diet.